You must have been part of several marathons but you might not have seen this kind of marathon which will be full of fun and entertainment. 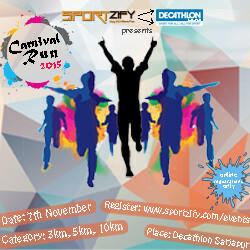 Wait for it people Sportzify along with Decathlon brings to you the Carnival Run 2015. This run will not only test your fitness and stamina but will also provide immense entertainment to all the kids and their parents. Breakfast will be provided after the event for all the participants. This festive season don’t waste your time relaxing. Be a part of an epic marathon. Hurry Up Register Online Only!